If we can take a brief moment from our regularly scheduled discussion of whether or not Yasiel Puig is the worst person in the world and if he’ll merely cost the Dodgers the playoffs or cause the entire franchise to fold, I wrote a thing over at FanGraphs on A.J. Ellis and pitch framing based on a conversation we had last weekend in Arizona. …but turns into Ellis acknowledging that he not only knows that the stats don’t like him, but that he knows exactly where they don’t like him, and the numbers do show that he’s been steadily improving based on that information over the last few years. Did he find that pitchers approached him differently in 2013 because he’d had success in 2012? 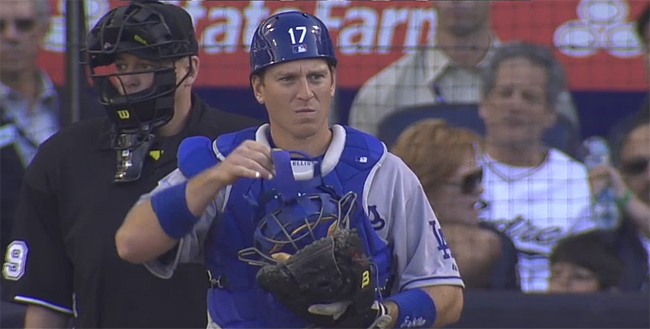 Did he notice all of us calling for Don Mattingly to hit him higher in the lineup in 2012? I also asked what is without a doubt the question the most people wanted to know — When is “Between Two Palm Trees” going to be on SNLA? — which I think he got a kick out of, and while it sounds like he has interest in doing another, his answer was perfectly valid: Between the short spring due to the Australia trip, and the fact that he’s a starting catcher, his time is somewhat limited. However, don’t totally shut the door on another episode sometime this year.